In the last year, it has become commonplace for many professional athletes to take a knee during the country’s national anthem. 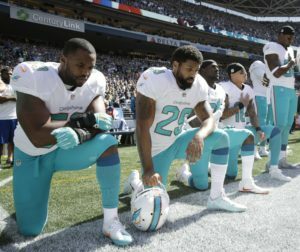 It is said that these athletes, particularly football players, do this in a “display of protest and defiance” according to The Sun. In the last several years, perceived increases in police brutality and the desire to highlight social injustices have led to these athletes’ protests. This initial movement by Kaepernick started a chain reaction leading other football players to take part in this form of protest as well. The protest has been seen at almost every NFL game since. Players have either kneeled, sat, or linked arms with one another as the anthem was playing. Some teams, such as the Pittsburgh Steelers, took it as far to be in their locker rooms as the anthem played. President Trump takes issue with the fact that many of these players are bringing their personal beliefs in a place where the only thing that should be going on, in his opinion, is football. However, there are many that feel that the players’ protests give a voice to a movement that does not get much attention in this country. However you may feel about the protests, they are having a direct impact on the NFL’s TV ratings. They are fluctuating now more than ever because of the different opinions on the movement. While the players’ main goal is to bring attention to the issue of race inequality in our country and still want football to be a priority, it will be hard to convince those who oppose this idea otherwise. This will remain a hot topic in the world of sports as long as it continues and will continue to impact the NFL each and every week. First-year Alexandra D’Angelo is a contributing writer. Her email is adangelo@fandm.edu.